Time really flies so fast, summer vacation is over and kids are now back to school once again. For parents with school-aged kids, our duties are not finished on just providing for their tuition fees and buying them school supplies. We are also responsible to help our kids with their homeworks and of course to supply for their everyday meals inside and outside the school. Yeah parenting is an endless job. I’m happy to know that I was able to inspire other moms out there who have kids who are picky eaters. They told me that their kids were able to eat and finish their food when they started designing their kids baon. Ren is not a picky eater, he will eat whatever you serve him. So I stopped decorating his baon, but I always make sure that somehow they are healthy. School age is the perfect time to teach children to eat healthy and why it is important to do so (they will learn the Go, Grow and Glow Foods). Unfortunately, it is also during this time that they can be easily influenced by the various people and advertisement in their environment. Curiosity is at it’s peak and we can’t blame them if they will try foods that are new to them. To support our child’s brain development at this critical stage, proper nutrition is needed. Children need a wide variety of foods for a well-balanced diet. The amount of physical activity they have in a day will be an important part on how much they need to eat. When children are busy and active, snacking is important to keep energy levels high. A healthy morning snack at recess and one after school are usually needed each day. They need to fill their tummies with carbohydrates for energy, protein for strength and fruits and vegetables for their immune system. Here are some of my lunch box ideas to inspire you. Unfortunately, with all this effort and your kids are still picky eaters, it is recommended to give them food supplements to get the nutrients that their body needs. One of the vitamins that I trust is Propan TLC coined “Tamang Lusog for Children”. It offers children’s daily nutrient needs such as Vitamin A – for sharper eyesight, 100% Vitamin C – for stronger immunity against sickness, Lysine – for appetite-enhancement, Chlorella – for faster growth, Taurine – for sharper memory Vitamin E– for beautiful skin; and Vitamin B – to create more energy. It is now available in 250ml bottles. good thing your kid is no food picker. My kids are all mapili sa baon and my wife has to be each day creative on what baon they should have. I wish I could do this too once my little one goes to school. It might just prove to be a challenge for me but I will do my all for my first born. Lovely baon ideas, Mommy Levy! I wish Justin is not a picky eater like Ren. There are times he goes home from school with leftovers from his snacks and lunch. ohhh, but he’s exposed naman in different varieties di ba? Wow! 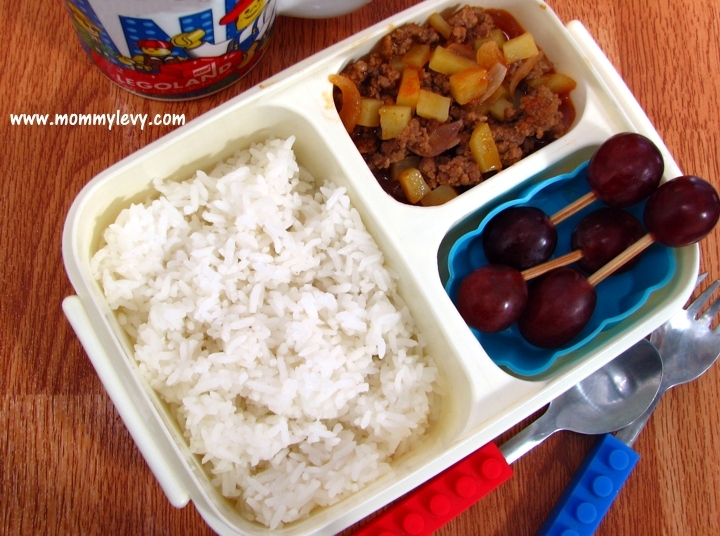 So creative naman your bento meals. Ma-try nga din. I agree, my picky eaters need food supplements. Hirap pakainin ng masustansya ang mga bata ano? Sarap ng goto sis! My kids love having baon to school, I prepare most of their food. These are all great ideas. I want to learn how to make those Bento boxes. they’re easy to do, I swear! I make bento lunches too (it’s in my other blog). Everyday single school day. I am glad that I have one week off from making lunches because it is summer already here. I will be back to making them next week because my son is going to a whole summer of day camp. I run out of ideas all the time, but I don’t mind, as long as he eats it, then I am happy.